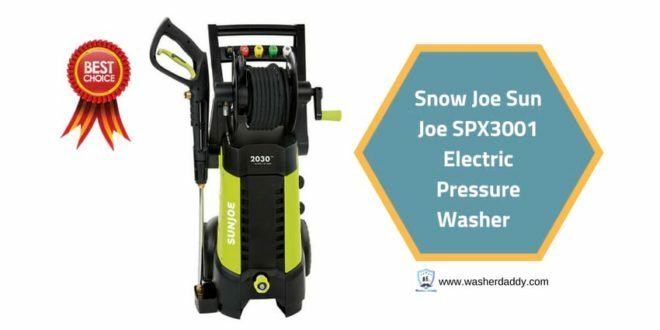 Sun Joe electric pressure washer is the best model everyone who needs a pressure washer should own. This product comes with an updated look and its hose reel is the best. This pressure washer is somehow expensive but it is highly rated due to its unique features. It is also among the bestselling units on Amazon. The unit is a perfect choice for use around your home and you will even love it most since it is accompanied with a two-year warranty. If you love Sun Joe and want the newest model that comes with the best hose reel and an updated look, then this unit will be your best and perfect option. This lightweight model is perfect for doing a smooth cleaning of your RVs, driveways, motorcycle, car, patio and many more things. The rotary scrub brush of this unit will let you to clean those tough spot like your car wheel and garbage bin. The scrub bristles are rotated by the water pressure and this will let the rotary scrub brush to remove dirt, as well as, grime from the surface. You will love your pressure washer so much since it gets closer to the surface helping you to lift away dirt and make the surface shiny. Get ready to clean larger surface area than before with this unit. It has the best extension hose that will let you clean easily without moving your unit from one place to the other. With this machine, you’ll save a lot of your time and also hassle. The turbo nozzle of this machine rotates and gives the best cone spray. You will enjoy using the 25-degree, 0-degree and the spray tips will let you to lift and blast stubborn dirt and grime. You will get the full force of the jet spray from the turbo nozzle but this force will never damage your device. You will perform a lot of cleaning task effortlessly using the five extra nozzle tips which are 0, 15, 25, and 40-degrees. The soap applicator nozzle will make your cleaning projects more enjoyable and fun. This unit comes with the most powerful motor which will give you the ability to remove dirt from surfaces. With up to 2030 PSI of water pressure and 1.76 GPM of water, you’ll be able to save a lot of your time and hassle. This is the unit that you need for the maximum cleaning power. Furthermore, the model is CSA approved meaning that safety and optimum performance is yours from day one. You will fall in love with 14.5 Amp/1800 watt your pressure washer machine since it comes with the best built-in onboard storage. You can easily store your power cord, spray gun and wand, and HP hose. This makes the model more compact and convenient. One more thing which you must know is that this device weighs 32 pounds only making it more lightweight to maneuver around your home. Its two heels which are attached make the machine to be moved effortlessly without demanding a lot of your energy and time. The total stop system will protect your machine since the motor will be stopped when you have not engaged the trigger. Also, this unit comes with extra-large detergent tank that is 1.2L and it will let you to carry your favorite detergents conveniently. You don’t have to strain yourself mixing the detergents and carrying them using a bucket. You’ll also love the spray wand which comes with a comfortable grip to let you clean with peace of mind. It provides 2030 PSI water pressure which is great for lifting tough stains from any surface. It comes with the most comfortable spray gun which will give you more power for your cleaning projects. The total stop system is a modern technology which will protect your device. The motor will be shut off when the trigger is not engaged. This modern technology will make the motor and pump last longer and you’ll finally save a lot of your valuable energy. You can do more of your cleaning projects without worrying about your motor’s durability. Next What is the best pressure washer detergent Product?